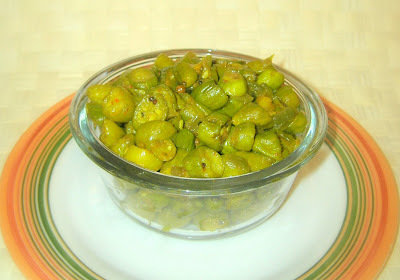 Tindora or Kovakka is one vegetable I cook in Microwave and then Roast in a Kadai to make it more crispier. Here's how I make the curry with Kovakka. Put the chopped Vegetable in a Microwave Safe Bowl. ( I use Microwave Rice Cooker to Cook Vegetables). Wash and Drain the Water. Close a Lid with a vent and cook in Microwave in High for 6 to 7 minutes. Heat Oil in a wide Non Stick Kadai and tamper the Mustard Seeds, then add the Urud Dal. When it turns golden brown, add the cooked vegetable. Stir and add the other Ingredients. Fry until the Vegetable is roasted. 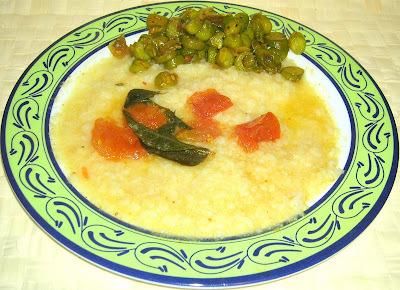 Serve as side for Saaru anna (Rasam Rice) or any Rice variety like Huli Anna (Sambar Rice). The vegetable can be chopped vertically too. This is a simple lunch plate for my little daughter. She loves this curry with Saaru Anna. Lovely recipe M...love the tomato rotis too....and also the new look of your blog, very nice indeed. I love this simple but delicious recipe too.I don't get it often but when I do ,I make this way.Looks yummy.Goes well with chapatis too. new look of ur blog looks good.i love kovakkai fry..mm!! Asha: Thanks. Yes, my husband usually does a chapathi wrap with this curry. He loves this way. Linda: thanks a lot and try this one. Its easy and delicious too.